The Karmic Wheel is a symbolic structure, derived as a function of the movement of the cards through the quadrations. For this study the has been chosen as a marker, used to create a map of the cards as the karmic wheel spins. For every quadration the moves in the framework from house to house in a seemingly chaotic manner. And after 45 quadrations the is again back in it's starting position, completing the loop. The graphic on the left shows a pictorial view of this movement, and provides a reference for the discussion that follows. 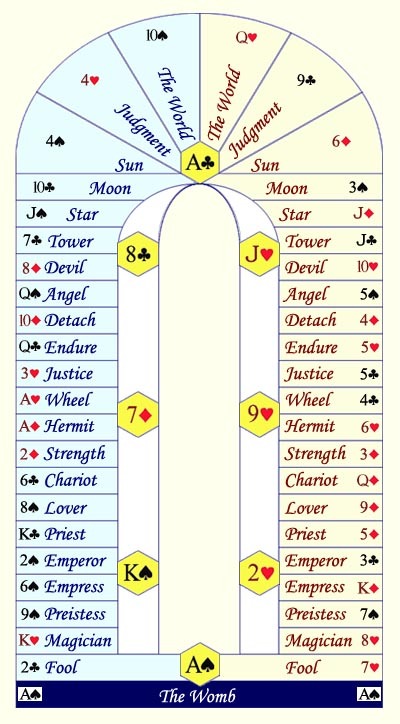 The layout of the cards in the graphic is representative of the cards in the natural order. We have already seen how the houses in the framework have been stamped due to the movement of the ( see The 22 Oracles). This graphic merely presents that information in a new and meaningful way. Notice if you will that some of the Tarot Major Arcana labels have been changed in some cases. As a rule, use of the Tarot as a reference for this study is meant merely to provide deeper insights into the individual card interpretations, rather than to provide fixed or exact definitions. The structure here is symbolic in a number of ways. The entire structure is reminiscent of a gateway of sorts, where 2 pillars are supporting an ornate arch. The pillar on the right represents the ascending order, reflective of our conscious--or active--mind. The pillar on the left shows the descending order, reflective of the subconscious mind. For each quadration, the cards on the outer rim of the gateway will move one position in the counter-clockwise direction. The planetary rulers have been anchored in the center of the structure, underscoring their fixed nature. For this example, each planetary ruler is associated with 6 positions. Please note that the planetary rulers are not involved with the movement of the karmic wheel, however I have found the placement shown here to be useful for this study. As always, there are an infinite number of ways to reflect on the nature of this work. The base of the structure is colored indigo, representing that earth forces are at the root of our experience. In this example, the takes on an interesting rulership role. As an archetype, the plays the role of the cosmic human. Its placement here is reflective of the fixed nature of cosmic law, and our place within it. Notice that the rules 3 positions: the ascending and descending 'Fool', and 'The Womb'. The entire structure pictured here is reminiscent of the Tarot Major Arcana 'High Priestess'. The priestess would be seated in the center of the two pillars, facing us. It has been stated that reflection on the symbolism of these two pillars alone would provide the keys necessary to understanding the entire order of nature. Having it show up in this study provides another means for making tangible such a lofty concept. The yellow pillar represents all processes that involve our conscious effort to manifest our desire, the end goal being to seek and unite with creator. For this study, this pillar has been linked to the process of Ascension. In general, Ascension involves the process of refining the conscious mental processes to such a degree that the Soul becomes free of the need for the body. Apparently, the body provides the means necessary for this refinement process. The blue pillar represents all processes that involve our subconscious, where the mind operates in a reflective and often self-questioning manner. For this study it has been linked to the process of Redemption. In general, Redemption involves the process of purification through the act of first releasing attachment to any outcome or substance, and then allowing the tangible to recollect due to the purely magnetic nature of our Soul desire. To make use of this oracle, find your birth card and note on which pillar it is rooted. This will give a general idea of the dominant processes that underlie the life stream. Note that the planetary rulers have been associated with the pillars as well, where in this example the and are linked with both pillars equally. In general the activity on both pillars will always be active, though the processes associated with one pillar will often dominate over those of the other.